Mel Bochner is considered one of the pioneers of Conceptual Art. He has helped to develop many of the techniques used by the Conceptual and Installation artists who followed him into the art world. His works sometimes feature bright colors and words, while at other times they appear more conceptual than artistic. 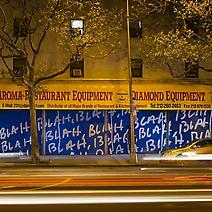 Bochner uses a variety of mediums, from oil on velvet to glass stones and chalk on the floor. During high school Bochner studied Art with Joseph Fitzpatrick, a teacher of young gifted artists. Later Bochner graduated from Carnegie Mellon University in New York, where he had studied Art. Bochner taught Art History at the School of Visual Arts where he later had his first showing; the 1966 show Working Drawings And Other Visible Things On Paper Not Necessarily Meant To Be Viewed As Art. Further teaching work followed for Bochner; he took the position of senior critic in Painting and Printmaking at Yale University in 1979, and taught at Yale in 2001 as adjunct professor. Bochner’s works were shown at the Yale University Art Gallery in New Haven, CT, as a retrospective titled Mel Bochner: Thought Made Visible. His writings on art included the book Solar System & Rest Rooms: Writings and Interviews and Mel Bochner: Thought Made Visible. The artist's work is represented by Peter Freeman, Inc. in New York, NY, Marc Selwyn Fine Art in Los Angeles, CA, Galerie Nelson-Freeman in Paris, France, Galleria il Gabbiano in Rome, Italy, and Two Palms Press in New York. Bochner lives and works in New York.